Finally, as a season untimely born, we are having a bit of winter. 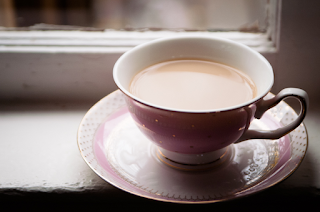 Sleet outside, Earl Grey inside. It's sunny (but cold!) here in VA, but now I'm feeling inspired to have a cuppa -- what an absolutely elegant teacup, by the way! Same here, in our part of Pa....we have had such 'springy' weather recently, but that all changed yesterday with over 2 feet of snow! A good day for tea, indeed! There is a grocery market in my town run by the local disabled persons organization. They carry Earl Grey a la Creme loose tea. It is divine. My favorite Earl Grey. I also love Lady Grey.